FeastHome – Having an induction cooktop or induction stove is a smart idea and a great way to save spaces in the kitchen area. This kind of stove is very modern and advanced so that it will be able to support your cooking activity. An induction cooktop is also very easy to operate. Here are some inspirations of an induction cooktop that you can follow. 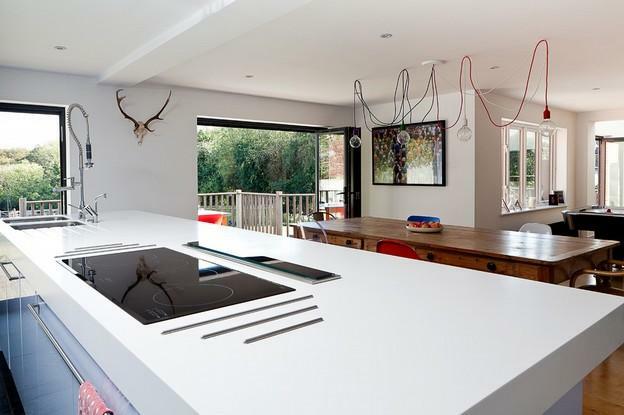 This kitchen area is in a modern minimalist style because it is dominated by white. The modern look comes from the induction cooktop used. The countertop is already spacious, and the induction stove makes it even more spacious. As it is said before, this type of stove is able to save spaces. The wooden dining table and dining chairs make this kitchen looks more attractive by adding a natural atmosphere. The householders add a simple yet artsy wall decoration, which is a deer head. The folded glass door allows a fresh air and sunlight to come into the area, making it bright and comfortable to have a meal. 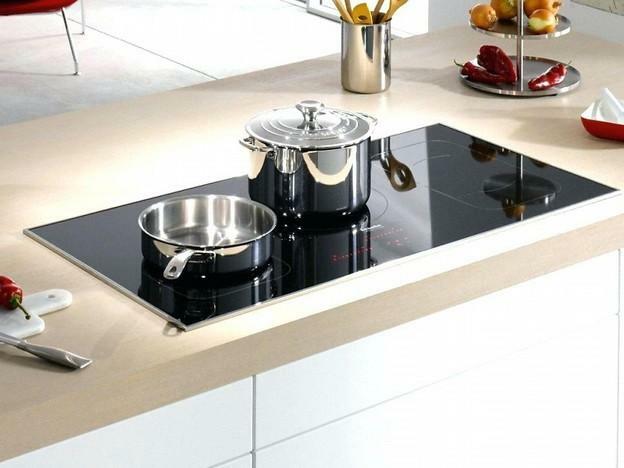 The induction cooktop in the picture above is very simple and modern. The induction stove is quite large enough so that the householders are able to cook some meals at the same time. 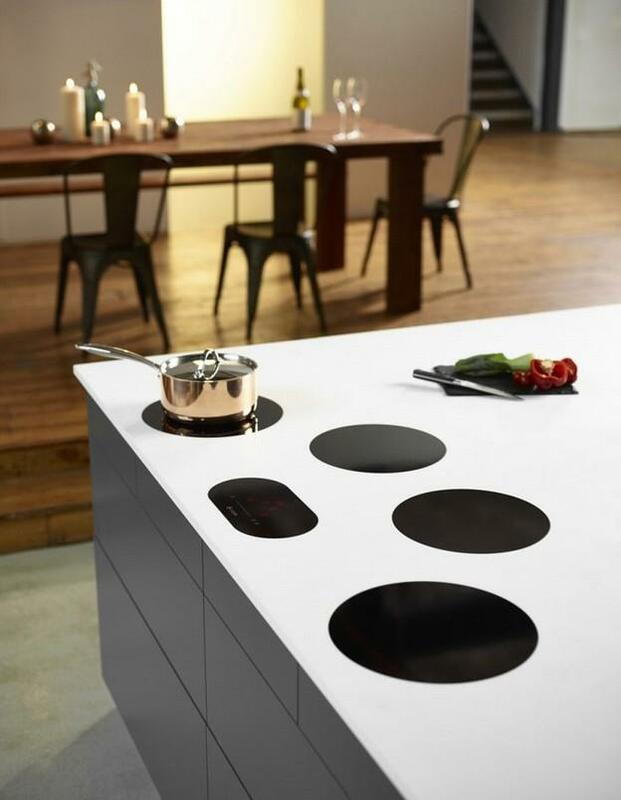 Moreover, the stove is super slim, so that it will look like you are cooking on the countertop directly. An induction cooktop is pretty easy to operate, making it easy for your cooking activity. 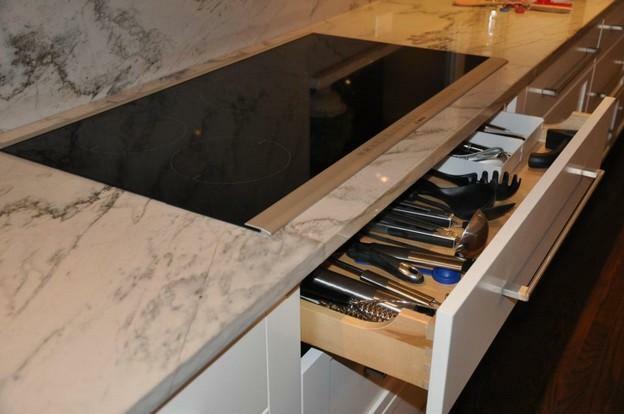 It is also able to save spaces in your kitchen area. There are a lot of types of induction cooktop nowadays. Not only the simple rectangular one, but there is also a separated induction cooktop just like you can see in the image above. The four circles are the stove, and the ellipse one is the operational buttons. This kind of induction cooktop is suitable for you who want to freely stir your cooked meals without having to worry about nudging other cooked meals. This separated induction cooktop is also very attractive. You can have it in order to instantly make your kitchen looks stylish and super modern. The induction cooktop in the picture above blends very well with the marble countertop. Its size also matches perfectly with the size of the countertop. The induction stove and marble countertop make the kitchen look so elegant. The kitchen cabinets are near placed, making it practical for the householders to take out the needed kitchen utensils. Those are the various looks of an induction cooktop. An induction cooktop is very advanced and able to save spaces. But its price is quite expensive. An induction cooktop works very fast. A big pot of water can be boiled quicker by using an induction stove than a gas stove. This is the reason why this type of stove is chosen. Because it is more efficient, save time, and save money. The temperature of an induction cooktop is very precise. It is very helpful when you are cooking a cuisine that needs a consistent temperature. An induction stove works by creating an electromagnetic reaction with a metal pan. It means that it is the pan that gets hot, not the stove. This prevents your kitchen to become hot and uncomfortable and make your cooking activity safer. There are no more cases you accidentally leave the stove on. In an induction cooktop, the cooktop will not get hot if there is no pan put above it. The surface of an induction stove is flat and smooth so that this kind of stove is really easy to clean. Moreover, an induction stove also has an attractive look which is able to add the aesthetic value to your kitchen. You are able to control the temperature you need for cooking quickly and precisely. In an electric stove, you have to slowly increase or decrease the temperature. There is no burning process if you use an induction stove. So that the smell of kitchen smoke can be minimized and your kitchen becomes healthier and more comfortable. You can only use the kitchen utensils which are made from a metal material or iron material. Because an induction cooktop has a flat surface, you have to use the kitchen utensils that have a flat surface too. It will be difficult if you cook with a round pan, even though you buy an induction pan adapter in order to overcome this problem. You have to be careful not to scratch the glass surface of an induction cooktop. This case can happen when the kitchen utensils scrub the induction stove. When there is a spill, the flat surface of the induction cooktop makes the spill flows directly to the floor. For some reasons, the spill can get under the glass surface, which is able to cause an electrical problem. But several induction cooktops are equipped by a spill detector, which will automatically turn the induction cooktop off if there is a spill detected in the surface of an induction stove. The price of an induction cooktop is more expensive compared to a gas stove or a common electric stove. But because an induction stove is more energy efficient, you should consider choosing this kind of stove. An induction cooktop depends on an electricity supply. So that you have to make sure the electricity supply in your house is stable. If the electricity supply in your house is unstable, it will be difficult to use this type of cooktop.